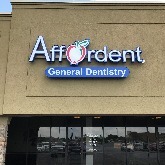 Affordent is a general dentistry office offering high quality dental services at very reasonable prices. Some procedures which previously took several visits weeks apart to complete (e.g. a crown) can now be completed in a day given appropriate conditions.